Toshiba, the same company that happens to make consumer laptops, has built a huge robot to help with cleanup efforts in Japan, following the nuclear disaster at Fukushima in 2011. The new robot, which was custom built by Toshiba, has been designed to help decommission reactor 3, which exploded when hydrogen built up and the reactor melted down following the disaster. 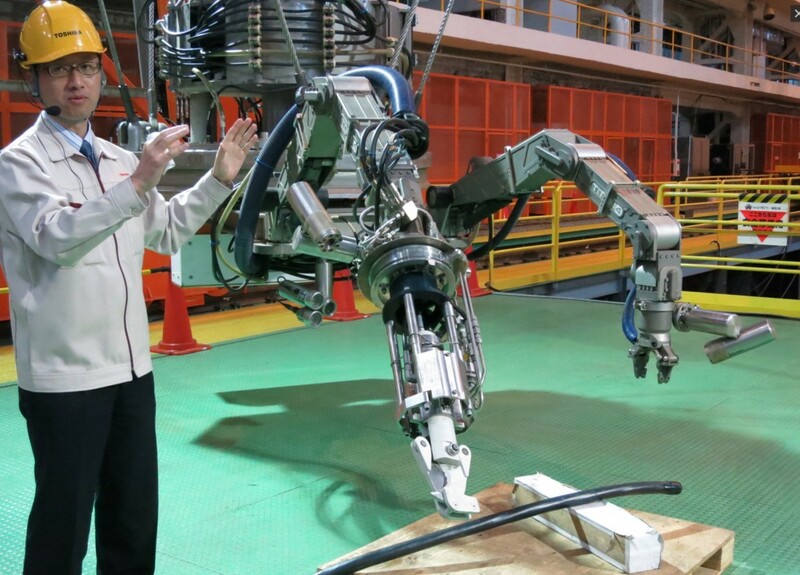 With two unique arms, Toshiba’s robot can pick up objects from inside the radioactive pool and cut them into smaller pieces, as well as remove spent fuel rod assemblies permanently. It’s expected that the robot will remove 566 fuel rod assemblies while it’s in service, and demonstrated how the robot will work this week in a short video. Built for remote operation, the robot is covered in cameras so its drivers are able to perform its tasks from the safety of another facility, given that radiation levels exceed those that humans can safely sustain. The Fukushima nuclear plant was decimated when a 9.0 earthquake, followed by a 15-metre tsunami engulfed the facility, overwhelming its defences and cutting off all backup power — leading to the ultimate meltdown of three nuclear reactors. Interestingly, Japan actually had a robotics program that kicked off in 1999 for just this purpose — cleaning up nuclear disasters when humans are unable to. It was ultimately halted in 2002, and the robots put into storage until 2006 when they were given to museums, meaning a device had to be built from scratch. The cleanup, which is expected to take anywhere between 30 to 40 years to complete, will be assisted by Toshiba’s new robot beginning in 2017, as it’ll take almost two years to install it before it can be operated.